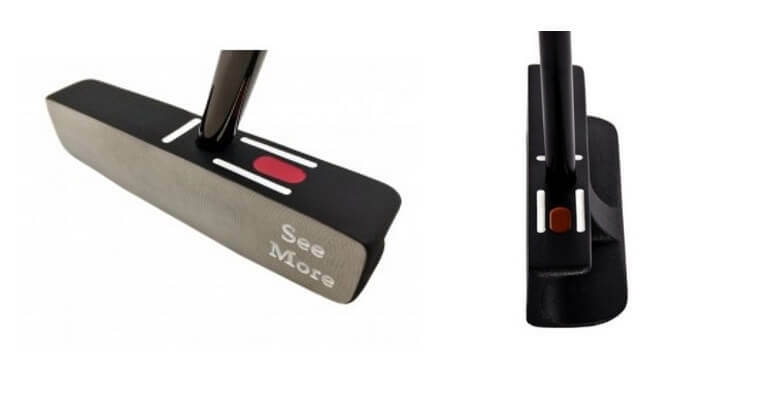 On this page you’ll find our detailed SeeMore Original Milled Series Putter Review, the pros and cons, and a side-by-side comparison with other putters we have recently reviewed. Maybe I’m a bit of a snob, but when it comes to putters, I’ve generally regarded myself as something of a purist. And, as a result, I don’t tend to look much further than milled putters when it comes to shopping. Many would perhaps debate the logic of such a view, and that’s fair enough. Nevertheless, for the purposes of such reviews, impartiality and an open mind are the key. Perhaps fortunately, I’ve never been much of a brand champion when it comes to SeeMore, so my inevitable excitement at sampling the milled range, in theory, would be tempered by that element, such that I could form a balanced view. 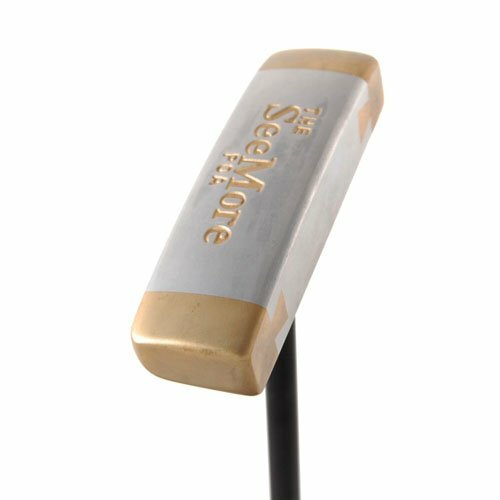 If you already own the SeeMore Original Milled Series Putter please leave your review in the customer review box at the end of this article. 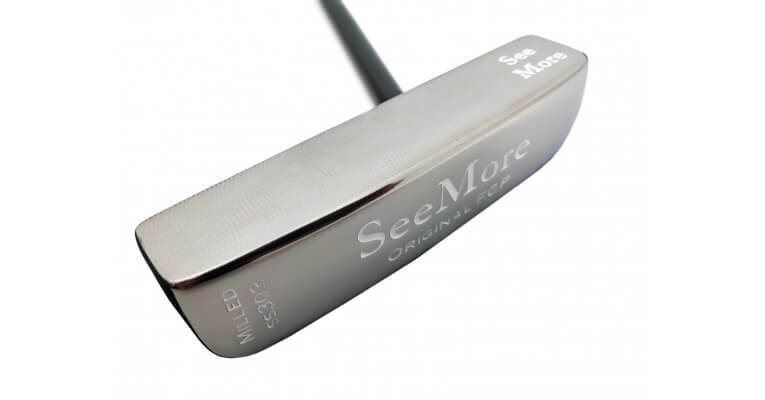 We featured the SeeMore Original Milled Series Putter in our Best Golf Putters Review. 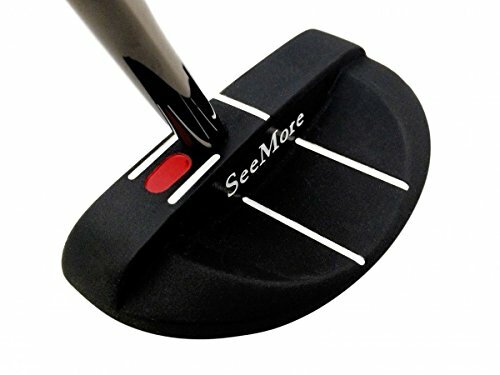 Looking to buy the SeeMore Original Milled Series Putter? 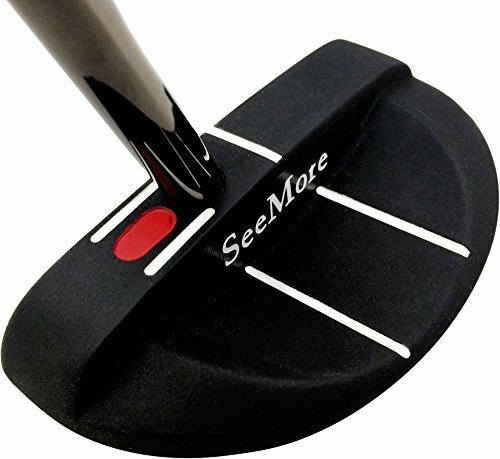 SeeMore Original Milled Series[/easyazon_link] offers a diverse range of putters each put their own stamp on things, and bring unique benefits to the table. Use the quicklinks below to navigate our SeeMore Original Milled Series Putter Review. Milled putters are seldom very far off the mark, and the SeeMore Original Series is no exception. A diverse range of putters each put their own stamp on things, and bring unique benefits to the table. None of them will probably win any beauty contests, and the lack of left-hand availability unnecessarily minimizes the market. But all in all, these putters represent very good value. And, as ever, SeeMore absolutely nail it when it comes to alignment – the Riflescope Technology is a winner. They just aren’t pretty. My opinion – take it or leave it! SeeMore absolutely nail it when it comes to alignment – the Riflescope Technology is a winner. Each of these putters are underpinned by SeeMore’s patented Riflescope Technology (RST), which is a wonderfully simple concept. 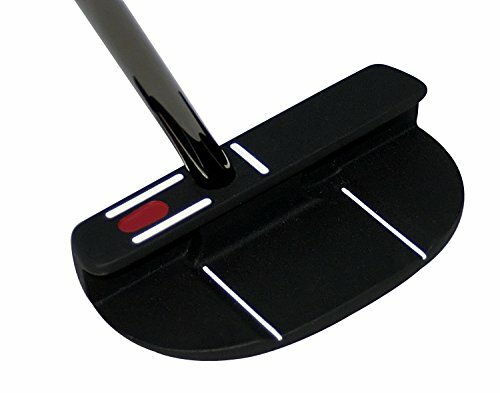 A red dot is flanked by two white lines, which the shaft will naturally obscure if your putter is aligned. The horizontal white line/alignment aid in the middle of the blade should then confirm that you’re locked and loaded. And if your stroke is pure, the red dot will be hidden for the entire pendulum action, and the putts will surely drop (provided you can read the greens!). In terms of the head material, cast 303 stainless steel is the substance of choice, with a TPU Poured face and milled insert on most of them. Note, the FGP and PCB putters have a re-milled face. The other fine bit of technology (for which there will be some sceptics!) is that the putter face is “balanced to plane”. What does that mean? It means that it’s dynamically balanced to sync with the angle of your putting arc, and thus naturally returns to square at impact. Unless, of course, you get ‘handsy’ at impact – not much help available to you then! 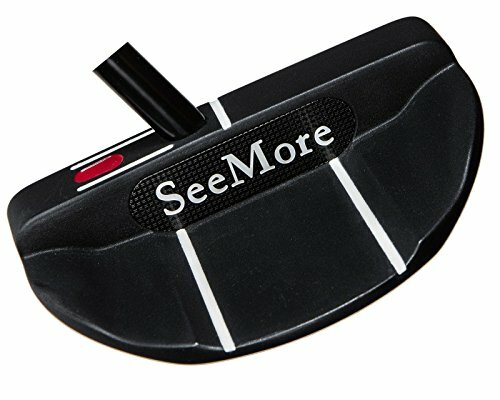 As with all putters, there is some adjustment to be made when it comes to feel, and I’ve always considered SeeMore’s feel to be quite unique. We gave the putters a go from various distances, and the immediate first impression is the crispness of the contact at impact. As you’d expect with a milled face, there is also a soft little pop when you get it in and around the middle of the blade, and the combination of this with the crisp sound makes for excellent feedback. I was also very impressed with the roll off the blade, and the consistency thereof. And for those who like to sweep the blade close to the ground as part of their natural arc, the polished chrome sole slides along the top of the grass smoothly and effortlessly. It really fills you with confidence when you know with fine-tuned predictability how the ball is going to respond at impact, and the sort of spin it will generate. After a while, it became quite metronomic, and my distances were spot on. How much of it is down to the hunter, and how much down to his tools? I’ll leave that to you to decide! Finally, in terms of alignment, SeeMore are pretty much peerless. At least within this sort of price range anyway. I found the offset putters slight-less superb, as it just feels like it disrupts the simplicity of the RST. Personal preference I guess. But all in all, the performance of these milled putters, without exception, was hard to knock, and alignment was very much at the heart of it. These putters represent very good value and SeeMore absolutely nail it when it comes to alignment – the Riflescope Technology is a winner. I’ve never thought you can reasonably accuse SeeMore putters of being world beaters when it comes to the aesthetics department. And I must be honest, as I sized up all eight of the Texas Wedges within this series, I didn’t really see anything to change my mind. All of them have the ever-pleasing chrome polished sole. They’re also characterized by back-of-center shafts (except for the PCB, which is pure center), with the trademark white lines and red dot (as part of the Riflescope Technology) towards the heel. For those who like blade putters, there isn’t much to distinguish between the FGP Original and the Si2, although the latter has an offset option (Si2w Offset) if you’re that way inclined. Of the mallet putters, again, there are distinct similarities between the FGP Mallet and the Si3. The curvature on the former is just slightly less exaggerated though, and, for me, it makes for a cleaner look. Once again, there is also the offset option with the Si3w Offset. The redeeming factor is that SeeMore have kept things very simple in terms of design, and prioritized simple alignment. Who could argue with that? I love the consistency across this series. The simpler brands keep things, the better – and pricing is no exception. More importantly, $170 is very competitive in today’s market, particularly when some manufacturers expect you to cough up over 400 bucks for a flat-blade! 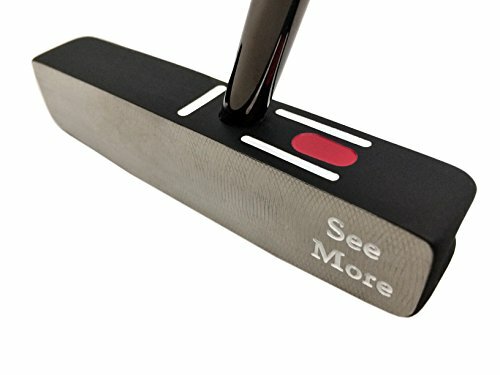 Okay, there are reasons for that, but while there is a palpable gulf in quality between the SeeMore Original Milled Series and some of the really high-end putters, I still arrive at the same conclusion when weighing up dollars versus performance delivery: this represents good value for money. And I think they’ll sell a lot of these putters as a result.